A Muscular Portfolio is a mechanical-investing formula designed by a financial expert, using a Momentum Rule on nine or more exchange-traded funds (ETFs), fully disclosed and free of charge. The book “Muscular Portfolios” (2018) reveals how any individual investor can keep losses below 20% to 25% — even when the S&P 500 is crashing 50% or more &emdash; and thereby enjoy superior returns over complete bear-bull market cycles. How are Muscular Portfolios different from Lazy Portfolios? Lazy Portfolios, which were designed in the 1990s, never make any changes in the percentages of funds they own. Because they can’t adapt to market conditions, Lazy Portfolios subjected investors to losses of 36% to 49% in the 2007–2009 bear market, adjusted for dividends and inflation. Most people find those kinds of losses in their life savings to be intolerable. Why is it important to keep portfolio losses low? The new science of behavioral finance shows that most people have a “behavioral pain point.” After personal losses of more than 25%, many people start liquidating their stock positions near the lows of a bear market. These investors also miss out on the first few months or years of the subsequent bull market, when returns are the strongest. This hurts investors’ long-term performance. The pain can be avoided by making sure a portfolio is designed to never drop more than 20% to 25% in the first place. It’s easy to keep losses this low — while achieving excellent returns — with a Muscular Portfolio. Are Muscular Portfolios active or passive investing? Neither. Muscular Portfolios are examples of mechanical investing: following a computerized formula rather than making intellectual-emotional decisions, which fall prey to behavioral mistakes. Active investing is the practice of buying and selling securities based on one’s own opinions, which has been shown to underperform the market. Passive investing doesn’t permit any portfolio changes at all, exposing investors to huge losses during bear markets. If the newsletter and columns are free, how do you make money? Neither MuscularPortfolios.com nor the author, Brian Livingston, sell any financial products or services. The whole point is to teach you how to grow your savings without paying any fees to anyone. Our website is the first place that reveals Wall Street’s secret buy-and-sell recommendations absolutely free of charge. We make money solely from the sale of books, seminars, and other educational information. Following a Muscular Portfolio doesn’t require any purchase at all — you can use each plan without paying a penny. 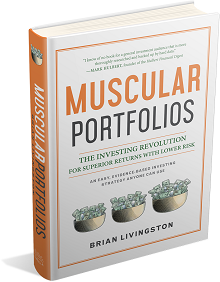 The “Muscular Portfolios” book is available at booksellers everywhere, and our monthly newsletter updates the book with the latest information. A free summary of the entire book is available on a StockCharts.com page.